Adhesions in the abdomen pull on parts of the intestines and sometimes cause an obstruction. Symptoms vary depending on the tissues involved. For example, in the gastrointestinal tract, bowel obstructions may occur. Mechanical small bowel obstruction after previous surgery can be the most severe effect of adhesions. In the uterus and in the pelvis, adhesions can cause infertility and other reproductive problems. 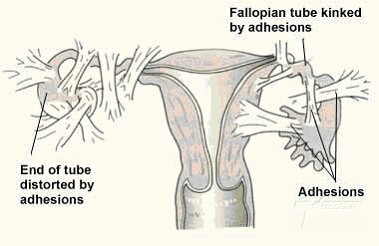 The adhesions can block the ends of the fallopian tubes causing infertility. Doctors associate signs and symptoms of adhesions with the problems an adhesion causes rather than from an adhesion directly. As a result, people experience many complaints based on where an adhesion forms and what it may disrupt. Typically, adhesions show no symptoms and go undiagnosed. These adhesions cause no problems at that moment , but they can obstruct the intestine in about 2 percent of all patients. These obstructions can occur several years later. 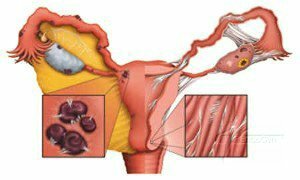 Intra-abdominal adhesions are usually the result of surgical or gynecologic operations, pelvic inflammatory disease (gonococcal or chlamydial), appendicitis or endometriosis. Adhesions may be responsible for chronic persistent abdominal pain without associated pelvic pathology. Though adhesions probably cause pain by entrapment of expansile viscera, the relationship of adhesions to abdominal pain is still controversial. In contrast, mechanical small bowel obstruction after previous surgery demonstrates unequivocally the most severe effect of adhesions. Patients with chronic or recurrent abdominal pain and a history of numerous abdominal surgical procedures are often denied treatment if they are not obstructed or symptomatic of intermittent bowel obstruction.